Do you wish your home were more peaceful? I sure did when all six of my kids lived at home. Even when only two were left, it still wasn’t peaceful the way I wanted it to be. You see I wanted everyone to get along and like each other. All. The. Time. I wanted an easy, stress free life at home. Truth be told, my heart’s desire was for my children to be more like adults even when they were little, which wouldn’t have solved our lack of peace problem because not even adults get along well, right? Homes are messy because people are broken and sinful and full of flaws. So how could we possibly have perfect relationships, especially with family members? The home that Dennis and I created was not a peaceful home in the way I imagined it to be, but it was a stable and mostly healthy home because we kept the main things the main things. Never doubt God’s good sovereign control, even when life makes no sense. Seek Him and grow in love for Him every day. Always practice forgiveness, even if you have to apologize and help your kids apologize and ask for forgiveness a hundred times a day. Learning how to forgive is more important than feigned peace. Remain teachable, even when you don’t want to learn another thing. To stop growing is to start dying. My lifelong love of reading books has helped me remain teachable. One of my mentors, via her writing, was Elisabeth Elliot. She said in an interview on FamilyLife Today that submission in marriage was something she struggled with every day! And she was in her 70’s when she said that! She was still learning. I was shocked because I assumed she’d have conquered that marital conundrum much earlier in her life. She was a spiritual giant to me. Her admission shattered an idealistic notion I had of eventually arriving at a level closer to perfection which would equal everlasting marital peace. Though I was shocked I was also greatly comforted that my marital struggles at 40 something were not unusual. She helped me see some of my thinking was still rooted in the wrong soil. Pondering that revelation in the days that followed reminded me that learning to follow Jesus, learning to live the Christian life as He intends, is never done, so therefore perfect peace at home is impossible and it’s ok. Conquering any struggle will only happen in heaven. My “job” today is to give thanks and surrender to His work in my life for I cannot produce change on my own. And sometimes I have to surrender to His ways many multiple times a day. My oldest daughter, Ashley, and I were talking one day about how unpeaceful her home is, and it’s not surprising; she has seven boys. Loud, sword fighting, nerf gun warring sons, the oldest ones now in the crazy schedule days of school sports, clubs and after-school activities. She told me she is learning that real peace in her home must start in her heart even if it never reigns in anyone else’s. If she is at peace, a moment-by-moment necessity, then she is less stressed by the ever-present chaos. She is also less likely to react selfishly to insults and is more likely to respond in grace when it’s needed. Oh I wish I had been that wise when I was her age with one less kid. Ashley is focusing on the main things; loving God, learning with her kids how to do healthy relationships, and always growing. And her house looks like it too, meaning it’s a mess most of the time. She would agree. Her kids are learning what it means to forgive, to give grace and to trust God in all circumstances, not how to tip-toe at home so as to not mess up mom’s perfect arranged living room. Home matters because it is God’s intended birthplace for faith. 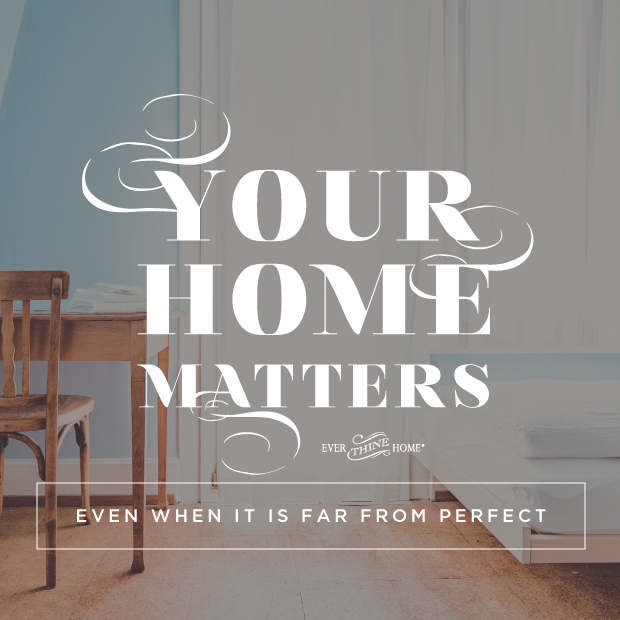 Your home matters too. Because nurturing those eternal relationships is the most important work a woman can do. I am a perfectionist in all areas! Motherhood, marriage, housekeeping, and now homeschooling. I have allowed the perfectionism to rule my life for way too long. I’m praying for God to help me let go & LIVE! Thank you for the encouragement! Beautifully said!! Helps me to not feel alone and helps remind me of what my priorities should be. I TRULY appreciate the reminder to let the peace of Christ rule in my heart regardless of what is going on around me with my kids or in my home. I also appreciate the reminder that we are all works in progress until we reach eternity. Thanks so much for sharing! Exactly what I needed to hear too!! I need to have the real peace in my heart so that I can have more grace and forgiveness for my kids…even if peace doesn’t reign in their hearts. Love that! Such a good reminder! Thank you so much. Sometimes, without even noticing, I allow physical chaos at home to affect my heart. It’s so true that relationships are far more important than how clean or how properly arranged the house is. What matters is how pure my heart is before God and how I do my part in nurturing the hearts of the people in my life. Thank you! A much needed reminder! Thank you for your reminder about keeping the main things the MAIN things. I have long ago given up living in a museum (even though I grew up around several successful museum-keepers)in exchange for home schooling our four kids, booster-ing various football teams, participating in many youth group retreats, leading small groups, attending Bible studies, hanging out by swimming pools, supporting Scouting activities, and packing in vacations and fun along the way. It’s been a busy ride and “Flexibility” is my middle name. But I really needed the reminder to keep MY attitude peaceful if I want my family to be peaceful. I am reminded, too, that PEACE isn’t the absence of conflict, but rather in knowing Whom is in control, that He has a good plan, and that God is always with me. Thank you, I needed this today. Thank you for your wisdom spoken in humility and kindness. Thank you for this devotional! My husband and stepson and I live in my father-in-law’s less-than-perfect farmhouse, taking care of him and of the farm. If there is order and peace in my heart, I am going to rest right there and not in the 1,000 things that need to get done or should be fixed. Teaching all of my men about what true love looks like and how grace feels comes first! ← I’ve Been Waiting to Tell you….